1977 was the dawn of the microcomputer revolution, with the stateside launch of the Commodore PET, Apple II and TRS-80 plus the 8-bit Atari VCS games console. But the US didn’t have it all to themselves, and in October 1977 the UK saw the launch of the Research Machines 380Z (or RM or RML 380Z for short). Aimed primarily at the education market rather than home or business users, the 380Z was a massive beast even for 1977. Built like a tank, the enormous metal case was designed to be rack-mountable, but the external keyboard was also a big metallic lump too. The name itself should give a clue that the 380Z was based around the Z80 CPU. The enormous case it came in reflected the wealth of expansion options beyond that – floppy disks, hard disks, video cards, interface cards and memory modules could be slotted in, make the 380Z a hugely powerful computer. In fact, the 380Z didn’t even have a motherboard as all components were on a card, which made it easy to modify or repair. Although originally housed in a light blue case, the 380Z quickly evolved into the imposing black case that became very common in schools. 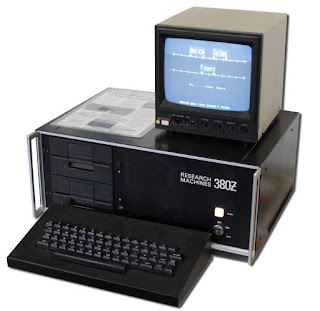 Even when rivals such as the BBC or ZX Spectrum started to appear, the 380Z remained a serious computer for serious work – one that could do things that other (and it has to be said – cheaper) computers could not. The 380Z could run the business-standard CP/M operating system, but it wasn’t really marketed as a business computer. 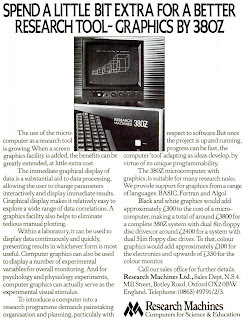 Just to prove its scientific and educational leanings, the computer was actually stylised as the 380Ƶ with a stroke on the "Z" to make it looks less like a "2". Fully-loaded, the 380Z would cost over £3200 (almost the price of two basic Ford Fiestas) with the very basic models coming in at just under £1000 (about half the price of the aforementioned Fiesta). It was certainly an expensive system, but Research Machines also eventually created the diskless LINK 480Z which could use the 380Z as a file server, which was extremely advanced for the time. Having found a profitable niche, RM went on to produce the Nimbus range of somewhat-PC compatibles, and after that it concentrated on PCs sold to the education market. RM finally dropped out of the hardware business in 2014 but it still exists today as a service provider to education. These days 380Zs are a rare find on the second hand market, if you can find one they seem to be a few hundred pounds each. Due to the robust nature of their construction, there’s a very good chance that it will still work though.